There is much you can do to help your young ones discover the wonders of writing. This list has buckets and buckets of tips for ages 4-8 (yep, pre-writers, too!). As you scroll through, pick your favorites. Do you have a tip to share with the world? 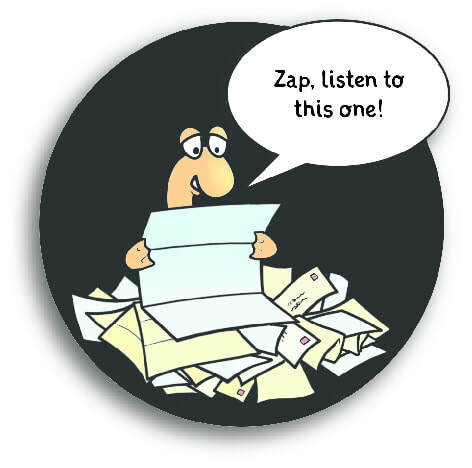 Zap would love to hear from you! "When you think about it, writing is the most complicated language skill that any of us has to master. It takes the longest to master... So first of all, parents need to empathize with the fact that kids are having to work very hard to accomplish their writing assignments. Zap's book is designed for children of different ages and abilities. 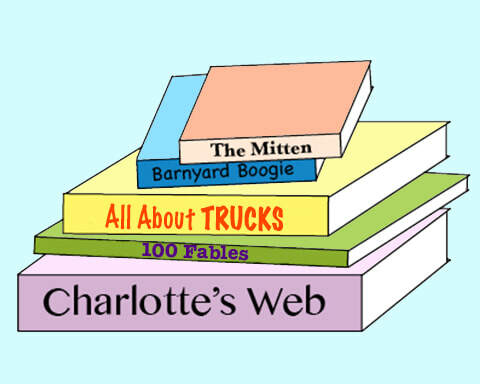 The lack of lines allows for big or small print and gives kids the flexibility to express themselves playfully in unlimited ways: writing upside down, along a squiggle, in dialog bubbles, etc. Still, lines can be helpful for many beginners. Does your Earthling need lines as a guide? They are easy to add. Get creative if you wish! 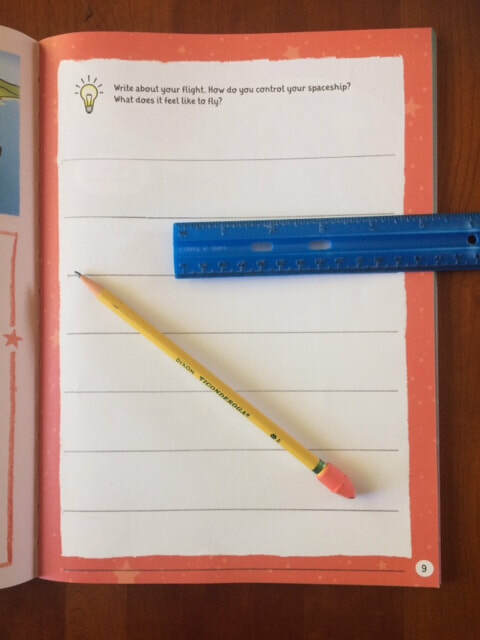 Each drawing prompt in Zap's book is a springboard activity for writing. 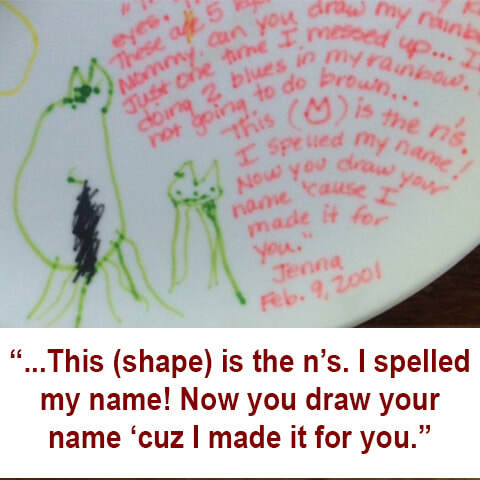 Help spark what to write with open-ended questions about your child's picture. Questions that invite more than one or two word answers. You'll likely be surprised how much story is hidden within a simple drawing! Can you tell me a story about your drawing? What's happening in your picture? What did they say to the fellow over here? Get up and show me how it moves. Then after: can you show me what you did with your words? What can you tell me about this gizmo? "More often than not, finding the peak learning zone depends on children and adults having a real (even if fleeting) connection and the opportunity to engage in meaningful conversation." - Erika Chrisakis, educator at the Yale Child Study Center & Author of The Importance of Being Little. Hide secret notes in places your child will find them. Play a game of searching for interesting characters, things, and places to write about while you're out on the go. Make up imaginative scenes, motives, and plots. This leads to fun conversations. Store memories in journals. Most authors I know kept a journal as a child. Make a tradition of sharing new and old entries on special days, such as birthdays. Ask your child to choose a recipe and write the grocery list. Make coupon books as presents for the family. These gifts of kindness are heartwarming to give and receive. My kids made Mother's Day coupons to water the garden, make a cinnamon toast breakfast, and give me a ten minute foot rub. Sweeeeeet! Have a notebook handy in your car, pack, or purse. Then use it! 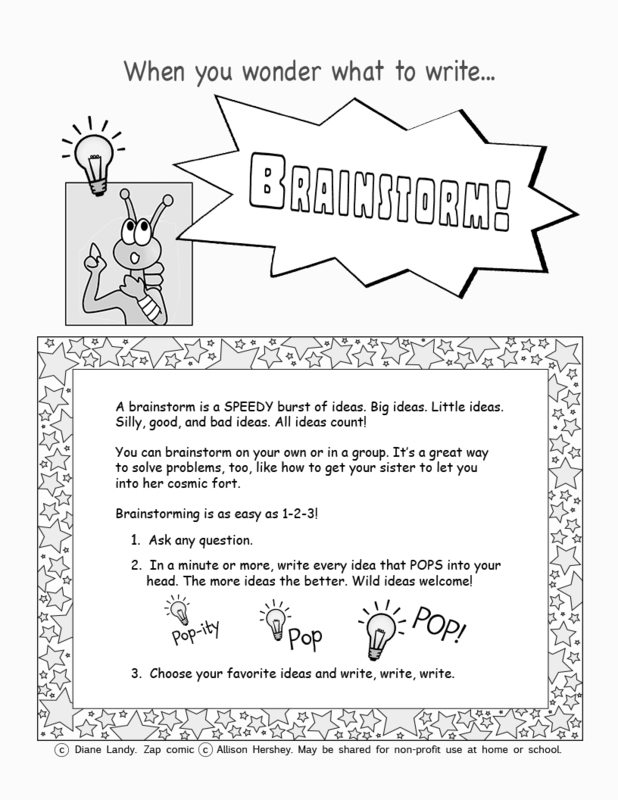 Brainstorm adventures, inventions, and robots with special skills (pages 28 & 29). One of Zap's young pilot testers invented a green, furry "Snugglebot". Who wouldn't want one of those?! 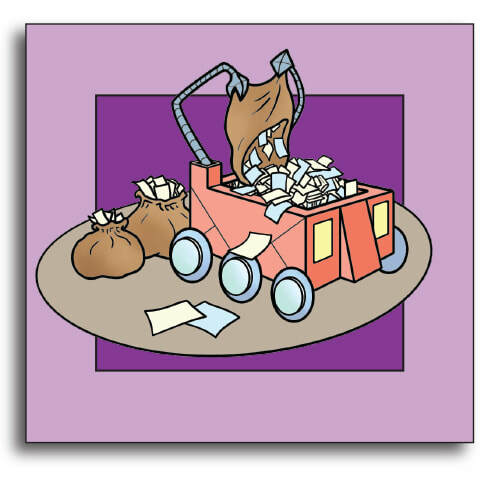 Have materials on hand for making posters, invitations, and cards. 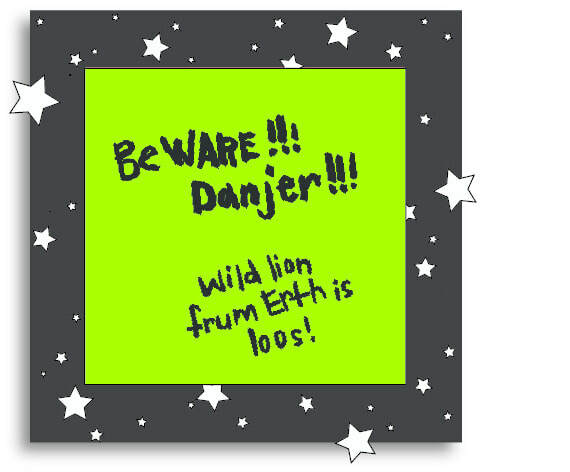 Zap's Free-bees page has Color-Me Signs and notes you can print. Cut words and pictures from magazines to make inspirational collages. Glue them to cardboard, a piece of wood, or a shoebox for storing keepsakes or collections. Remember to say, "That's a great idea! Write it down." "Zip-zapper-ZOT! You're my robot." This is Zap's magic spell to turn his friend into a reading, writing robot. Created for youngsters that can't write yet, older writers can benefit from this trick on occasion. Does your seven-year-old write a short sentence or two and that's it? Sentences that don't fully reflect his potential? This is common, especially when the physical act of writing is a challenge. 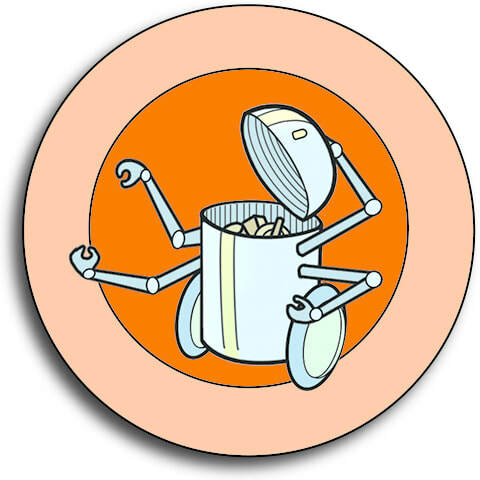 Having a robot helper allows creative thoughts to fly more freely. ​This tip usually works so well I have to ask students to speak slowly so I can keep up! If you have a recorder on your phone, have it handy and you won't miss a single word. When successful, the robot trick reveals what young writers are capable of creating and delivers a power boost of confidence. Give it a try, but please use it sparingly. Older children NEED to practice writing by themselves, just as an athlete needs to practice shooting a ball into the net. Having someone else shoot for you does not win the game. Robots get to decide when the Zap's magic spell wears off. When my battery runs low, I give a warning beep that means I'm about to shut down. Brainstorming is featured on several pages in Zap's book. It's a spectacular way to spark ideas for what to write. Let's say your child brainstorms the question, "What animal will I write about? ", then chooses a whale from all her answers on the page. She can then brainstorm AGAIN to get details for her story: "What do I know about whales?" Brainstorming can be used in other ways as well. How to talk mom into a pack of bubble gum? How to make up with Sally? It's a useful strategy to call on for any question or problem. 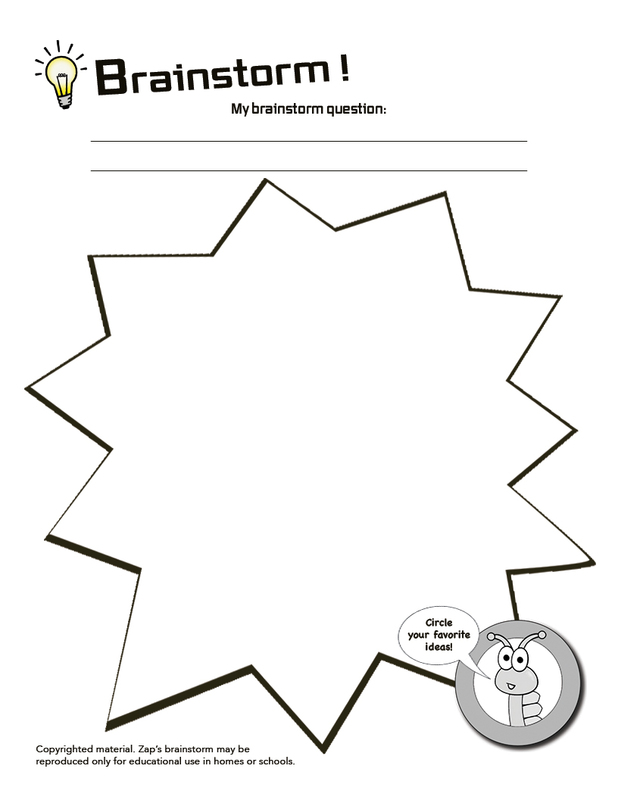 Download Zap's printer-friendly brainstorm form and directions for use at home or school. This tip has worked wonders in the classroom for ages 6 and up. Especially when writing about an event or moment from the past. Suppose a boy wants to write about a time he fell down (page 27), but has a serious case of writer's block. I say, "Pretend to call a friend on the phone and tell him what happened. Start from the beginning. OK?" Then I punch numbers into the invisible phone in my hand, listen for the ring, and pass it over. The one-way phone conversation almost always centers on the action and mood of the event, which makes for interesting writing. When he hangs up the phone, I add, "You know just what to say. Write that down!" As soon as his pencil touches paper, I get out of his way. When I check back in, I usually suggest he add something more from the phone call, like the sweeping gesture he'd used or the way he'd said a certain line. "Remember how your voice changed at this part? That was such a cool detail. Add that in, too." A family pet requires attention, a place to rest, and supplies. Adopting a writing routine needs these very same things. First figure out the WHEN. After a meal? Before bedtime? When grandpop watches the kids? Quiet is nice but not necessary. I'm amazed by how much writing gets done in noisy classrooms. Second is the WHERE. Zap's book is highly portable so there's no problem there. Still, a special spot to write shows your child it's in important activity. Encourage continued practice by providing a small table or desk, a chair, and a bit of storage for supplies. Pens, crayons, pencils, pencil sharpener, and eraser. A ruler is handy to add writing lines, if needed. Envelopes (I collect these from my junk mail). A stapler for making books. A hole punch and string or yarn are handy as well. Recycled magazines, catalogs, or calendars with fun photos. Plus scissors and glue stick. A clipboard to use outside, in other rooms, and on the go. Zap's Brainstorm and Color-n-Write Signs from the Free-bees page. "Writing helps us convey ideas, solve problems, and understand our changing world. ​Writing is a bridge to the future." For a more fun ways to play with words! CLICK an icon to FOLLOW ZAP on PINTEREST or INSTAGRAM! A show of genuine interest and encouragement are probably THE most important things you can do. 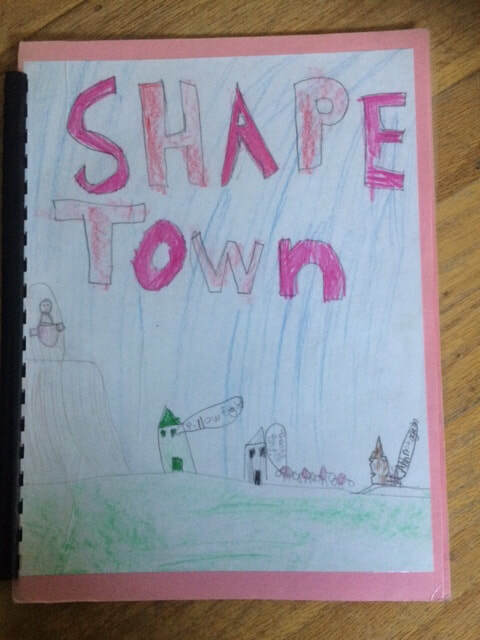 They let your young author know his or her writing is something you value. Listen and talk with your child about his or her writing, if only for brief moments each week. Over time, your attention will make a world of difference. "At the heart of my recommendations lies the relationship with the young child, which is the one learning tool that trumps all others." 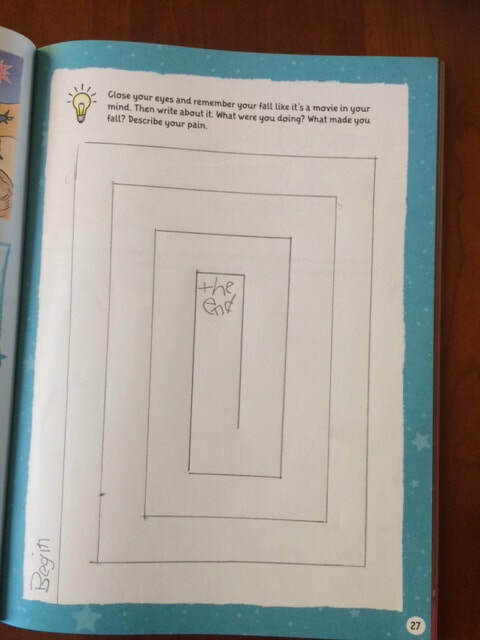 I need to collect more evidence about this, though it's worth noting that an early pilot test of Zap's book inspired several ELL first graders to write. These bright, creative kids had resisted putting words onto paper prior to playing with Zap. What a delightful surprise to have witnessed this transformation! I'm unsure exactly why they responded so well. Were they energized by the focus on storytelling versus mechanics? Did they relate to Zap because he's from a foreign land, cannot write yet, and makes lots of mistakes? Had I influenced them with a bubbly presentation? I can't say for certain and am seeking input to find out. Have you used Zap's book with an ELL student or class? This section needs your feedback! Please put ELL in the subject line and write: Diane@adventureswithzap.com. ​Thank you for contributing to the content of this tip. Connecting to a child's interests is top on my list. If a boy is obsessed with fishing, I encourage him to share what he knows. He could write a how-to book, a story about hooking a leopard shark wizard that grants three wishes upon release, or a yarn about a pet fish from outer space (pages 38-39). Reminding students that their readers are kids their own age or younger knocks out performance anxiety. Otherwise, it can be intimidating to write for a parent, teacher, or other adult audience. 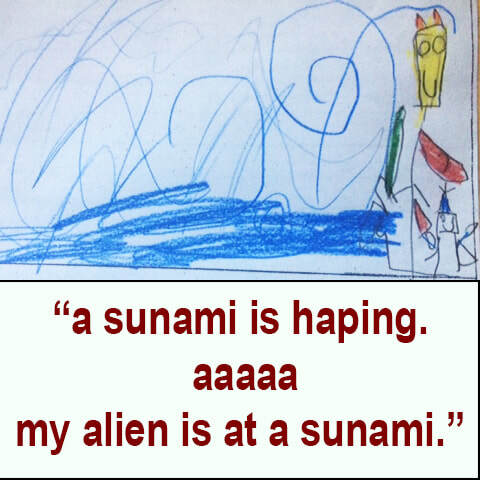 One of the benefits of Zap's book is that children are writing for an alien who knows little about Earth. It's empowering for a child to be the expert for a change. Sitting next to kids, I act as a guide-on-the-side rather than the director of a lesson. It seems to put them at ease. Having children see themselves as authors is vital. This is one point where all the experts agree. Kids have an endless stream of imaginings and escapades to share. Help them understand this truth. Venturing through a swamp of crocodiles is a story. Losing lucky shoes is a story. So is pretending to be a burrito, a firefly, or a superhero (pages 32-33). Keeping the focus on the ideas of writing, rather than mechanics, is the best role for me. I find that when I release the pressure of conventions, the story-telling floodgates open wide. This tip--when blended with the one above--typically works well for children who perform below their peers. Accepting that a young author's writing belongs to the him or her is important. If I make it mine with well-intended corrections, I'll likely be dismissed in a flash. Kids are royalty when it comes to their writing. They have the final say. And I let them know this so they may take pleasure in their power. Nudging gently and consistently--yet knowing when to back down--avoids a power struggle. Once writing becomes a battleground, it's difficult to recover. I'm sorry to say that I know this from experience. If it happens to you, retreat for awhile. Then keep on the lookout for chances to coax your child into giving it another try. Write with spaghetti noodles or use a stick in the dirt. Jump ahead to a prompt in Zap's book that ties in with something that happened today. Plan an outing, on paper. Or write a note to convince Dad to... what? Please do not surrender! Approach each writing project with joy, imagination, and humor. This can be contagious! ​​ "Many of our attempts to help young people develop writing skills actually deter them from the joy and power of developing a unique, insightful writing voice." 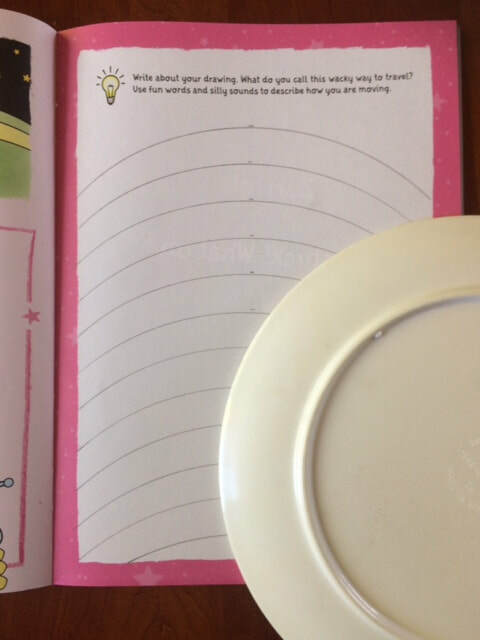 Page 3 in Zap's book introduces editing using C-R-A-M-S. Check it out and start slowly, one step at a time. Want another editing tip? Many authors belong to a critique group of other writers ( I'm in two). We read or listen to each other's work. Then help one another by pointing out parts where the writing is strong, places that could be stronger, and weak spots that need to be fixed or omitted. The friendly feedback helps us know what paragraphs to revise before sending our work to an agent or editor at a publishing house. Why not set up a CRITIQUE CLUB at home? 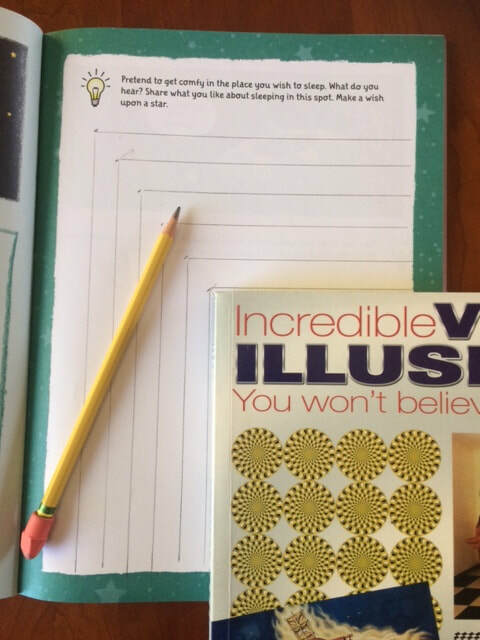 Simply take turns reading a piece aloud, then you--and/or other children--can each share: 1) one thing the author wrote that was out of this world, and 2) one thing the author could add or change to clarify or enliven the story. This helps your child improve while feeling like a pro. Four year olds can easily fill in the blank to change a refrain, such as in this popular book by Eric Carle: "Brown bear, brown bear, what do you see? I see a _______ looking at me." For older children, "What if...?" questions following a story can open the channels of imagination. What if the monkey were a hippo? What if they were in a jungle instead of on a farm? What would YOU do if you were a bird that couldn't fly any more? What if the ghost were af-f-f-raid of the m-m-m-mouse? Invite your kids to come up with "What-ifs" of their own. There are other ways to mix things up: create new sounds or different dialog, add a character, view a scene from another's perspective, change the end, or talk about the sequel. The goal is to step into an author's shoes and begin to explore the world of possibilities. Interesting conversations are likely to emerge. Playing with the elements of creative writing--character, setting, plot and theme--is excellent preparation for every young author! 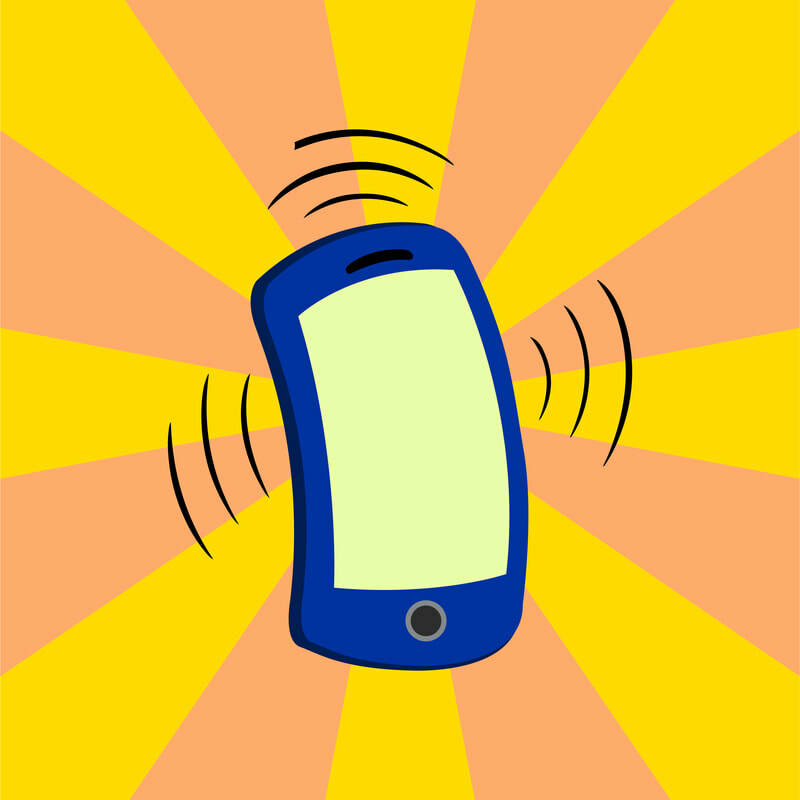 Zap would love to hear from you! This section is just getting started - please visit here again ! Many bookstores, copy centers, and businesses offer services to make your own books, though a single hardcover book can be in the $30 range. Is your child a beginning writer who writes half a sentence then stops? When great effort is needed to construct the first few words of a line, it's easy to forget midway what you'd wanted to say. After reading a writing prompt, ask your child to think of a full sentence and say it aloud before picking up the pencil. Repeat the line back it if it helps. Committing a full sentence to memory in advance can prevent getting stuck when the act of assembling words takes full concentration. Thank you, Teacher Nancy, for this helpful tip! Zap encourages beginning writers to use INVENTED SPELLING. As the example on the left shows, invented spelling is guessing how a word is spelled based on the sounds--the phonetics--of each letter. 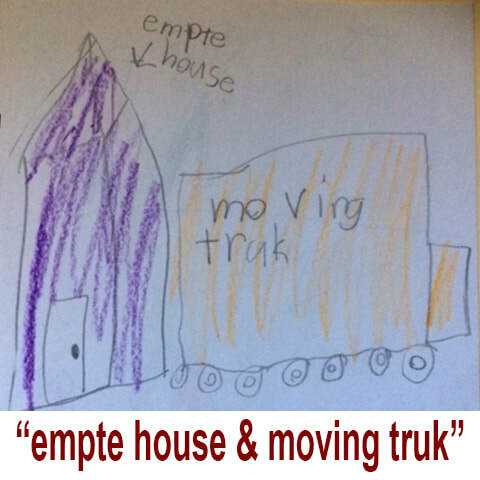 Most educators agree that invented spelling is developmentally appropriate and, therefore, is a commonly practiced step on the path to becoming a writer. "Writing their first words should be as exciting as speaking their first words." Have a "spelling time" that's separate from creative writing time. Children can circle words they think they've misspelled and review them with you. Have a children's dictionary handy to look up words. Label common items in your home that are important to your child and difficult to spell: pencils, teapot, bicycle, phone, kangaroo. Wait. What? You don't have a kangaroo in your kitchen? Play spelling games such as Boggle or Cailou. Although the board game Scrabble is for ages 10+, it can be simplified for young ones by ignoring special squares and word scores. Search local bookstores or online for lesson plans and workbooks designed for home school parents and teachers. Google "alphabetical list of sight words" and print it out. Some lists are broken down into the first 100, second 100, and so on. Ask teachers! They have wisdom to share. Everyone loves to discover a hand written note in the mailbox. Who would love to get a letter from your child? Who would your child like to write? Add an astronaut, the tooth fairy, and leprechauns to your list! An annual family newsletter is a wonderful tradition to begin. There are a number of ways young kids can pitch in: a drawing with caption, a personal news item, a wish for the New Year, and so on. Consider a field trip to the post office to talk about how letters are delivered. Events adults take for granted can be fascinating when seen for the very first time through the eyes of a child. ​"Stories are the heart of writing. I believe young children should START with the HEART.